Norco players and head coach Rick Robinson leave the field after the first loss of 2019, 4-3 to Santiago, on Thursday. Photo: Steven Doi/Norco Softball. 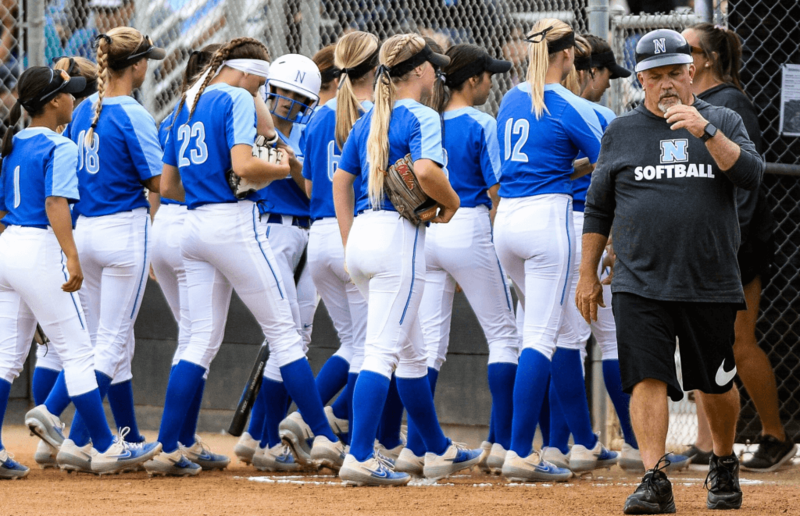 After running the gauntlet of some of the top high school softball tournaments in the country, including last weekend’s Michelle Carew Classic, Norco (California) High finally saw it’s 33-game winning streak end Thursday in a 4-3 extra inning loss to Big VIII League rival Santiago (Corona, California). Santiago (14-15-1, 5-2 in league) lost 1-0 to Norco on March 12 and looked like the nationally top-ranked Cougars would pull another one out and keep its league winning streak of 35 consecutive wins going as Norco (24-1, 6-1) had a 3-0 lead going into the bottom of the 5th inning. However, the Sharks put three on the board to tie it in the bottom of the 5th inning and broke through for the walk-off single by soph. outfielder Kaylah Nelsen in the bottom of the 8th to shock Norco, which ironically was down 6-0 last Saturday in the 5th inning of the Carew Classic championship before winning 7-6 over Orange Lutheran. Norco looked good early against Santiago as Sharks starting soph. pitcher Savannah Hooks, who is committed to UCLA, walked Norco sr. outfielder Raegan Cheyne, an Ole Miss signee, with the bases loaded with one out but was able to work out of the jam limited the scoring to just one run. Hooks loaded in the bases again in the top of the 5th inning and sr. infielder Paige Smith, also headed to Ole Miss, singled home another run before a bases-loaded walk to jr. middle infielder Kyleigh Sand put the score at 3-0. It all turned around for Santiago in the bottom of the 5th as Norco sr. pitcher Sarah Willis, a Washington signee, walked Nelsen with the bases loaded. After an error pushed home another run, a sacrifice fly by sr. catcher Hana Suniga, a Furman signee, brought in the third score of the inning to tie it at 3-3.